it's getting to be that time of year when preparing slow roasted meats or dishes in the slow cooker sound wonderful. 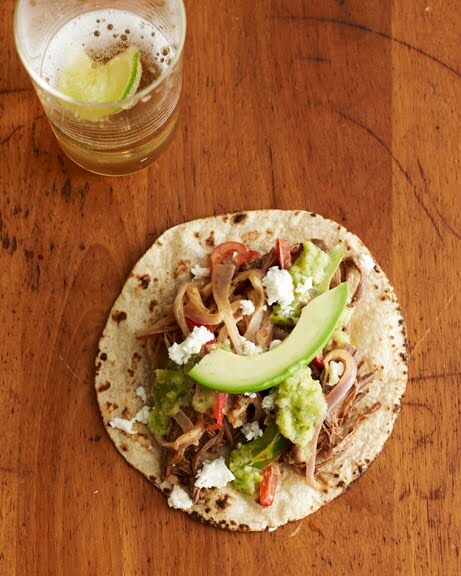 this recipe was inspired by a dish we saw on diners, drive-ins & dives from a fantastic looking mexican place in cleveland - slow cooked brisket, shredded and served as yummy tacos! and it's the perfect dish to smother with this roasted tomatillo salsa. excited to go apple picking with a friend from out of town this week and to check out this farm stand. also had an amazing day wandering among sculptures and beautiful fall colors in the hudson valley here - definitely worth the drive out of the city! preheat oven to 300 degrees F. in a small bowl, combine coffee, salt, jalapeno powder and chile powder and mix. rub all over brisket to coat well. heat a large dutch oven over medium high heat and add olive oil. sear meat on each side until nicely browned. add remaining ingredients plus 2 cups water and bring to a simmer. cover and transfer pot to oven and cook for 3 hours or until tender. remove meat from broth and set aside until cool enough to shred. strain liquid and return to pot. simmer over medium heat until slightly reduced. stir shredded meat into broth and keep warm. heat olive oil in a medium saute pan over medium high heat. add peppers, onion and garlic and saute 10 minutes or until softened. stir in heavy cream and oregano. for each taco, top a warm corn tortilla with about 1/4 cup meat, a few tablespoons of stewed peppers and onions, salsa, cheese and avocado. enjoy! Looks so good. I love tacos, and avo. Can't wait to make this. Yum :) So glad you posted this.